At one point this morning it seemed as though nothing could go right. It is partially my fault for checking my email and seeing that there was something for me to update on Jesusculture.org, but regardless, it set me off to a bad start almost 5 hours after I had woken up (and yes, 5 hours after I woke up was still the morning, and it was probably before a few of you woke up). Interestingly enough, this isn’t the first time in the past week that making an update on the Jesus Culture website has gotten me rather mad. I would not think twice about it other than the fact that I do not get angry with people. Fortunately I am getting angry at the internet or the website not working properly instead of getting angry at another person, and double fortunately I am not getting angry at it when anyone is around, however, I don’t want to get mad at anything except for a holy anger at the devil. I was running a little bit late to help my friends because of trying to squeeze in more than I had allowed time for. Then I went to the post office to finally put in my change of address form but I couldn’t remember the new address. Then I noticed that I could have done this online. So I drove to the old house to find that nobody was there giving me the opportunity to go back to the apartment to get my mail forwarded online. Then I check my email and see that the website was needing a pretty important update. The internet worked long enough for me to see that somehow the link to the page I was updating got messed up. Then when I knew it needed to be fixed, the internet would not work. After getting a phone call back from my friend asking if I was still coming I tried one more time and this time it worked! Thank you Jesus! So after 15 more minutes of fixing the problems and updating the site I was on my way. I lacked planning and didn’t have my priorities straight to follow through on the commitment I had made to help my friends. Soon after arriving to help them I realized another important lesson: If you don’t know your purpose then you are almost completely useless and ineffective. I felt very out of place as I stood around wondering how I could help. I didn’t know my purpose and because of that simple bit of knowledge, I didn’t get much accomplished. It is my goal this summer to have a purpose, some of which I have already laid out, so that I know what I want to do and what I need to do in order to accomplish it. It’s heating up! 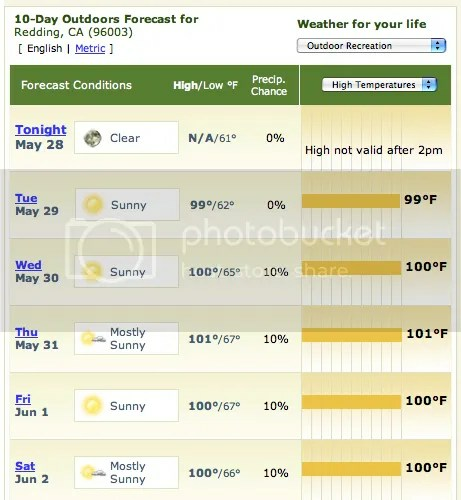 yes, that is the forecast over the next few days for Redding. I am starting to believe that it is imperative for me to live a life of radical faith in which every day I am doing something that streches myself. For instance today I heard the story of some students (not at Bethel) who for a few hours read and prayed scripture about Jesus and Peter walking on water and then for several hours attempted to do it until one walked across the pool that they were at! Think about it. How can we expect to do the impossible if we are too worried about trying in the first place. It is time to turn up the heat! I am getting back to that place of desperation and I am actually feeling the heat on a situation when I would need a jolt of faith. I am so thankful that the desperation for more has returned because it honestly was not fun to be in the place of not even wanting to pray for people. I would rather be sweating because I know that I should approach them than just walk away without hardly giving it a thought. It is time to turn up the heat on the devil! I am starting to see why the devil seems to have so much authority on the earth (notice how I said “seems”, because in reality he doesn’t!). It is because we don’t do anything to keep him from prowling around and doing as he pleases. If we would be on the offensive then he would have no option other than to retreat. Come on! How many of you know that you could stand in a fire pit as long as you wanted as long as there was no fire. In the same way, if we put no pressure on the devil then he isn’t going to give up quickly. Of course in the end, he has no option because he has already been defeated, but what is our purpose if we refuse our right to co-labor with God? Let’s turn up the heat on the devil and go out and help God to kick him out of here! Oh wow, what a day I had yesterday. I woke up at 4 am to take a classmate to the Greyhound Bus terminal and after I dropped her off I thought it would be fun to go to the prayer chapel. Good choice. As I prayed I was more aware of His presence and also angels than I have been in a while. After that I had some good soaking time and then went home. I read my bible and made some breakfast. Lol, the only thing I “made” was the bagel that I cut in half to put in the toaster. Later, when I was reading “The Reality of the Supernatural World” by Todd Bentley, I was hit with some pretty good revelation about the need to maintain spiritual disciplines. I don’t want anyone to start debating with me, so I won’t touch any specifics, but it was easy to relate what he wrote to my own personal experiences of having trouble doing something when we haven’t been doing it regularly. For instance he gave the example of having a hard time getting back into doing meetings after having a week or even just a few days off. However, if he has been doing meetings every day then it is no problem for him to get going the next day. Likewise, revelation from reading the bible comes best when we actively read it every day. If I make a habit of ministering to people in public it becomes easier to do, but if I don’t do it for a while, it is very difficult. Something really seems to be happening in the spirit for me. Maybe it is because I am spending more time in prayer (it isn’t because of performance, but rather familiarity!) and in God’s presence. Last night at pre-service prayer I was really getting touched and started to laugh a lot, which I haven’t done in a while. I went on outreach and was on a team with two of my favorite people. These people would blow you away. We had a blast and ministered to a lot of people. It all started with one of them following arrows they saw in the spirit and then passing it off to the other who felt that we should go to IHOP (Pancakes, not Prayer). So I pull in and before we even get inside the building we immediately found people that matched several words of knowledge. One man’s knee got healed and another one’s vision improved. While talking with our waitress and telling her how great she is, I start to think that we should bless her with a large tip and immediately after I think that my friend gives a word of knowledge that we were supposed to bless a Native American and she happened to be one (I wouldn’t have guessed it and we actually ran into more Native Americans before we left that did look like it). So we end up leaving her a large tip and after ministering to many other people we headed back. We didn’t make it far before I noticed a man walking on crutches, so we did a U-turn and pulled over to talk to him. We prayed for him and my friends both prophecied over him. While we were praying I could feel heat transfering from my fingers to his knee. He was really touched. It was awesome. So we went to a street that our group leader had written down that has nothing on it except for one intersection. Well, there was a car stopped at that intersection. Turns out one of the girls was teaching the other to drive. We were able to pray for them and just let them know that God thinks they are awesome. After that we finally went back to the church.